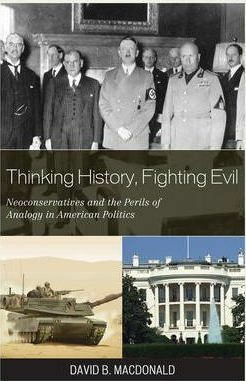 This accessible study critiques the rise of a new exceptionalism: a victim-centered nationalism promoted by American conservatives since the 1980s, borrowing imagery and vocabulary from the civil rights era and political correctness movements of the left.Thinking History, Fighting Evil explores the instrumentalization of anti-Americanism and anti-Semitism in the service of U.S. foreign policy, paying attention to how conservatives approach 'far enemies' (Islamism), 'near enemies' (Europe and Latin America), and the 'enemies within' (the domestic left). David B. MacDonald is a well-known scholar in the fields of international relations, genocide studies, and American politics. He taught at the Graduate School of Management Paris and was a senior lecturer in political studies at the University of Otago, New Zealand, before taking up his current appointment in the Political Science Department at the University of Guelph. He is the author of Identity Politics in the Age of Genocide: The Holocaust and Historical Representation and Balkan holocausts? Serbian and Croatian Propaganda and the War in Yugoslavia. He is also co-editor of and contributor to The Ethics of Foreign Policy.